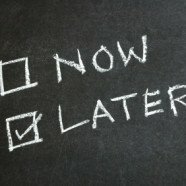 Home » Resistance » Start Procrastinating! You read it right. I said, “Start” procrastinating. Why? Because I’ve noticed that some of my most productive friends and colleagues are true procrastinators. 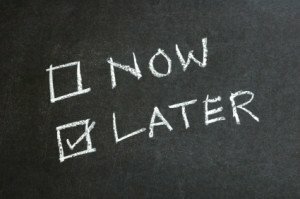 They fall into a type of procrastinators that I call “The Do-ers”. They simply Do what has to be done. Sometimes this comes with a cost. Basically they put off things that don’t serve their purpose, in order to be completely uninterrupted dong one thing at a time. They accomplish bigger, more important projects. Type 1 = Excuse Makers. These people do nothing to further themselves and make a ton of excuses. They surf the web, sleep in, socialize more than needed and claim to not have the time to even do their laundry. They are probably still living with their parents. Type 2 = The Organizers. These people work on things that are less important, mostly small stuff. Perhaps they organize the house, do the laundry, write too many thank you notes, and get caught up trying to create the perfect environment or try to find the right time to work. Basically, they procrastinate on things that have zero chance of being mentioned in their obituary. Type 3 = The Do-ers. These people procrastinate by working on something more important. They value uninterrupted time and will put off little things in order to get the big stuff done. These people might have messy houses, or stacks of papers on their desk, but big stuff gets done and when they are done they either hire someone to take care of the small stuff, or they save it for down time. BE WARNED: the most dangerous form of procrastination is unacknowledged type-2 procrastination, because it doesn’t feel like procrastination. You’re “getting things done.” Just the wrong things. Organizers beware! Make an immediate list of “small stuff” i.e. : laundry, cleaning, organizing, oil change, yard work, etc. DO NOT do any of them for two weeks. After you’ve made your BIG STUFF list pick one and get to it. Do not allow yourself to be distracted. Put aside big blocks of time even if it means sitting at your desk and staring at a blank screen. Eventually you will write that book, or get that marketing project done, or art project or whatever. The key is to not do anything else, even if it means sitting in the room alone in fear. I promise the fear will shrink. 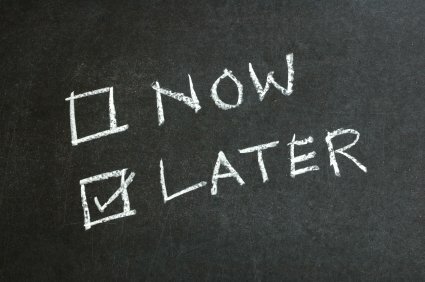 You will get started, do more, and finish projects quicker than if you fill your day with interruptions. Need help or accountability? Contact me and we’ll get it done!